A music video on the interpretation on how the Martial Law can affect the lives of the Filipinos. The music video show how the Marcos’s lived an extravagant life at the expense of the Philippine government’s money. 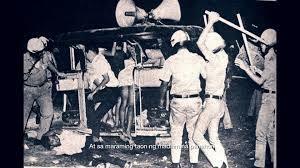 It also shows how the martial law victims were killed, abused and tortured by the government. The number of deaths and human rights abuse is shown to remind that the Marcos’s did this to the country. It shows how they spend lots of money from foreign debts while the poor Filipinos suffer from poverty and sickness. They fooled the whole world that the economic status of the Philippines is strong and progressive. The video is a strong message that Filipinos should not forget how people suffer from Martial Law. Filipinos need to make sure that Martial Law will not happen again and ensure that the peace and humanity in the country will not be taken away.